The Escalante has a catalog weight of 8.2 oz/232 g men's size 9, 6.5 oz/182 g women's 8. My size 9 beats the catalog weighing in at 8 oz. The stack height is 25mm heel/25mm forefoot so the same stack height as the Instinct/Intuition All Altras are Zero Drop from heel to toe. The Foot Shaped toe box is of course on board with the last following that of the Torin 2.5. It is intended to fit in the Altra line between the Instinct and Torin. Retail $130. Available now in Men's and Women's styles from Altra here as well as other retailers at bottom of the article and at your local running store. The heavy magic is in the midsole outsole combination. Escalante features Altra's new EGO midsole (details here). 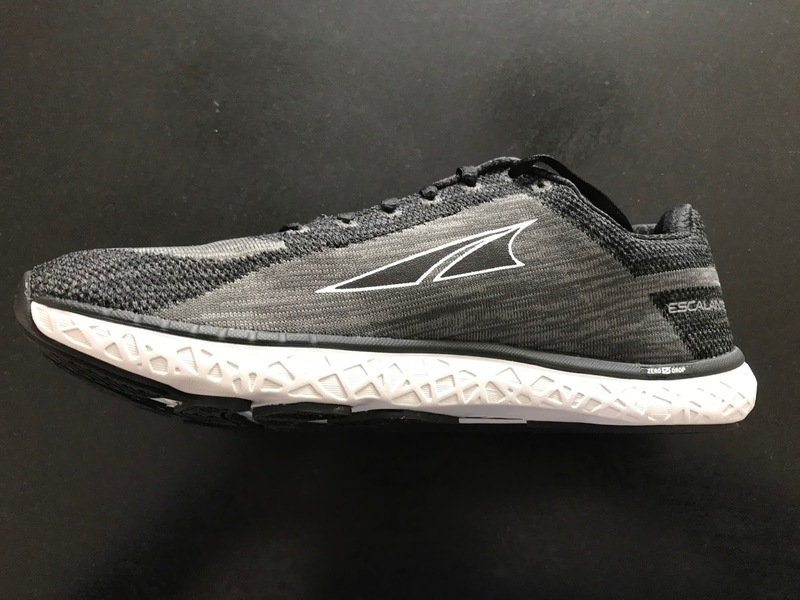 The goal according to Altra founder Golden Harper "is to offer the holy grail of running shoe cushioning-fast and springy, yet comfortable and soft". EGO is not pure EVA or even from what I can tell a minor blending of EVA and rubber or other compounds. In a clue it is Altra says it is designed to perform "better and more consistently in extreme temperatures" and "have long term durability to maintain excellent cushioning and energy return properties". This sounds a lot like the claims made for adidas Boost and Saucony Everun TPU based midsoles. In terms of softness to touch the Escalante seems a touch softer than Boost and about the same as Everun but as the Boost "popcorn" of expanded TPU are larger the cushioning feels about the same as Boost and a bit softer than Everun. It is definitely softer to the touch than the RMAT in the Hoka Hupana (my 2016 shoe of the year see here). The Escalante outsole is dense, firm rubber arranged in a what looks and feels like it is in a stride and wear dynamics correct layout and one that due to its coverage, thickness, and firmness one that does an excellent job stabilizing the soft EGO. I have only run once in the Escalante, 7 miles at a slower tempo pace for me of 8:48/mile. Road Trail Run's full review will follow soon. As described in the marketing, the first ride was fast and springy especially in the forefoot, more springy and fluid than Freedom ISO with less of a sense of bottoming out and then some heel instability and we are talking a zero drop shoe for the Escalante and not a 4mm drop as for the Freedom ISO. At a very light 8 oz for a 25mm stack of cushion the Escalante also challenges the Hoka Hupana, Clayton and Clifton along with the Skechers Performance GOrun 5 and GOmeb Razor and Saucony Kinvara in the low weight to overall stack Sam's Ratio-adding forefoot and heel stack and dividing by weight. As Escalante is a Zero Drop shoe there is for sure some sense for me as a heel striker with poor form of "missing the heel". I miss the heel a bit more than in the Torin 2.5 which has 3mm more foam all around in the midsole, about equivalent to the Altra Impulse (my 2015 shoe of the year here) with its firmer foam and 2mm less heel height. As I always say when writing about Altra... I wish they included "training heels"I cut the rear of an old sockliner into a 2" section and put under the supplied sockliner but didn't do so for my first test run. If you are new to Altra and Zero Drop it is very important to transition gradually. The Escalante takes Altra into new directions. The knit upper execution, foothold and comfort is excellent. 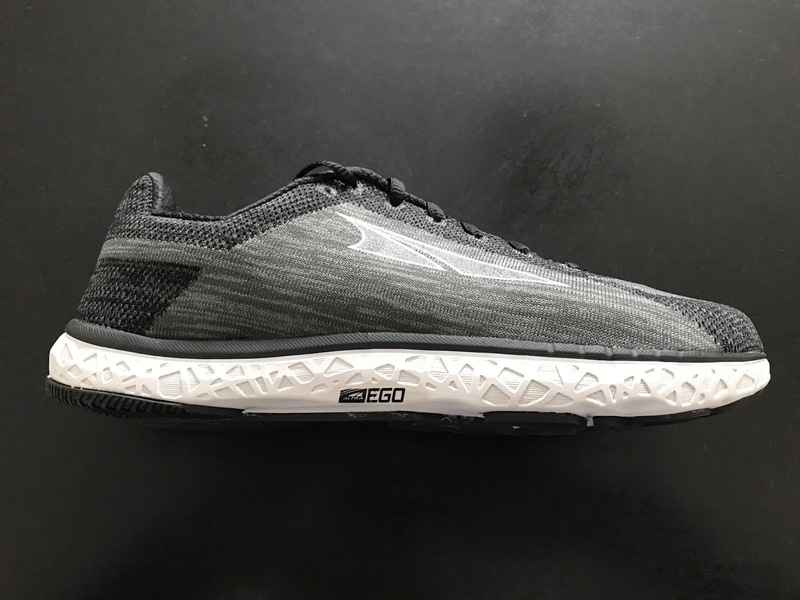 The new EGO midsole and outsole combination in my view does move Altra towards that "holy grail" combination of fast, springy, comfort, and soft in a big way. Road Trail Run will have an in depth review with multiple comparisons very soon written by sub 3 hour Masters marathoner Peter Stuart and Altra Ambassador and sub 15 hour 100 mile runner Patrick Caron. The Escalante was provided at no charge. The opinions herein are entirely the author's. Get the Escalante at the stores below. Your purchase helps support Road Trail Run. Thanks! I've had my eye on these. So the last is the same as the Superior's? The Superior's fit me perfectly, but not the Lone Peak's. I thought I read this is the "Performance Last"? Hi John H, The Escalante is on the same PFS2 last as the Superior 3.0. I believe last of S3 hasn't changed. Thanks for reading Road Trail Run! You can also follow us on Facebook, Instagram, and Twitter. Sam, Editor. This is an exciting sounding shoe, looking forward to the full review. Hoping you're able to compare it to the Altra One series as it's my only experience with Altra (overall good but fit is poor, way too much volume). Anonymous, Absolutely we will be comparing to the One. Both Peter Stuart and Patrick Caron have run the One and for Patrick it is one of his daily trainers. Thanks for reading Road Trail Run! You can also follow us on Facebook, Instagram, and Twitter. Sam, Editor. Hi Tobs, Thanks for reading and writing! The Instinct and Escalante both share a 25mm stack with the Escalante having the more bouncy softer EGO. The One is 2mm lower at 23mm and has more conventional EVA and if I recall it is soft and very flexible, both maybe contributing to bottoming out and bruising? I think you will find the Escalante more cushioned and easier on the feet than the Instinct. To really be cushioned I would recommend the Torin 2.5 at 28mm of stack. Still lively and by the way also a very good trail shoe due to its upper if your terrain isn't wet and slippery. You can also follow Road Trail Run on Facebook, Twitter, and Instagram. Thank you for the information. I have worn the Torin, but felt a little hefty for me. I will try the Escalante. I'll find you on facebook too. Hi!I have Altra One 2.0 size us 11, or UK 10, so what size would i need in Escalante , same or half size down.Cant really try them anywhere here. Psiho79, I'd go same size. Psiho79, I agree with Peter! Same size as the Altra One 2.0 should work great. Let us know what you think after you try them! Thank you for your comments! I was asking because i have a thumbnail of the space between my biggest toe to the end of the shoe(and they fit me great except for the lower upper of the One 2.0- but it will strech) so i was wondering is the size same in Escalante and Lone Peak 3.0 also as im considering to buy them!And sure after i get them and try them i will post a comment. Hi! I'm from Taiwan and now wearing Saucony's Kinvara 8 in US10.5, Freedom ISO in US11. What size will you suggest about Escalante? There's no distributor or retailer of Altra in Taiwan, so I'm trying to get one from Amazon or other way else.